The district has all reasons to smile as it has got air connectivity but deficiency in a basic service — no bus service to Bathinda airport yet — is casting a shadow over the big project. A few private buses are already designated on this route to Virk Kalan village where the airport has come up but the bus stop at this village is around 2 Km from the airport. Recently, the Municipal Corporation had purchased around 18 new buses for the city, in addition to the 10 buses already plying in the city. The 18 new buses are yet to be operational as they await inauguration. Though these buses were supposed to be inaugurated on the same day when the airport was opened, following the death of PRTC chairman, it was not done. Virk kalan, around 25 km from Bathinda city, is out of Municipal Corporation limits. Recently, the private bus union in Bathinda had opposed the plan of the PRTC and the Municipal Corporation Bathinda (MCB) to start these 18 new mini buses on routes where mini buses are already operational. There are only two transporters having route permits and about 12 timings on Bathinda–Virk Kalan route. Buses leave for Virk kalan after every hour. However, there is only a single private bus that goes to Bhisiana village. As the Bhisiana Airforce station does not allow entrance through its area, the bus from here has to cover more than 2 km to reach the Bathinda airport. “The buses going to Virk Kalan village can be given diversion so that they reach the airport, but this power is vested with the District Magistrate,” said Baltej Singh, president of the Mini Bus Operators Union, Bathinda. “We welcome the decision of the government to bring 18 new buses for the city but these should not be made to ply on routes of mini buses where already, the private transporters are operating their buses on small profit. There are no route permits with the PRTC as the court orders are pending. So, we will not accept plying of buses on routes of mini-buses. The government or district authorities can make operate non-stop buses from the Bathinda bus stand to the Bathinda domestic airport without picking any passenger on this route called Bathinda-Virk Kalan route,” he said. 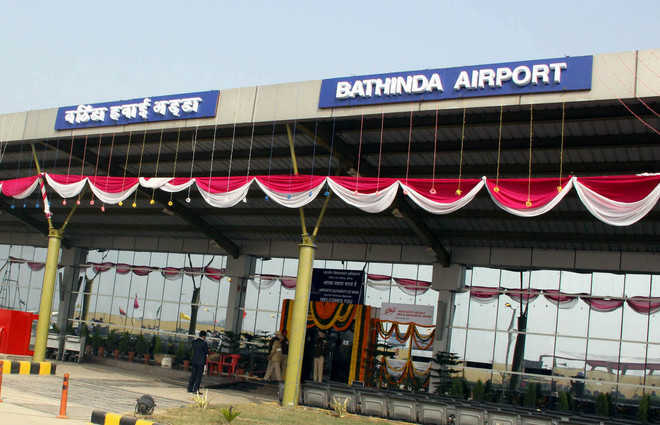 Union Civil Aviation Minister Ashok Gajapathi Raju inaugurated the newly built civil air terminal at Bathinda airport on December 11.